Each year International Women’s Day is celebrated globally in various ways. In Italy and Russia men traditionally give women sprigs of bright yellow Mimosa blossoms to commemorate the holiday, and in China women are given the day off. Well, leave it up to New Yorkers to chicly celebrate the occasion by raising their glasses and toasting to the infinite past, present, and future accomplishments of women! This year, at Julie Reiner’s Lani Kai cocktail lounge in SoHo, Compass Box Whisky Co, and Ladies United for the Preservation of Endangered Cocktails joined together for the third annual “Whisky and Women Unite” cocktail party. 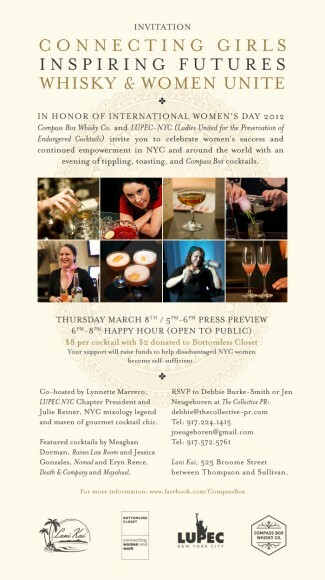 Women gathered at this spirited celebration to only to honor the occasion and raise money for Bottomless Closet, a non-profit organization that helps disadvantaged New York City women transform their lives by helping them to become self-sufficient and thus allowing them to succeed in the work place. In honor of the occasion New York City’s most talented female mixologists blended together six different deliciously refreshing cocktails using Compass Box Whisky’s newly produced Great King Street, a craft blended scotch whisky.